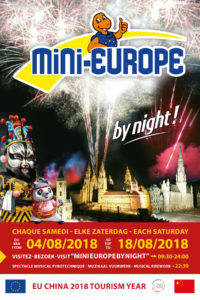 This year once again, the miniature park in Brussels will be staging its traditional son-et-lumière show. On Saturday, after sunset and until midnight, an incredible cocktail of lights will create a fairytale atmosphere. This 23rd edition of ‚Mini-Europe by Night‘ will be even more festive than previous years, because it takes place in the context of EU-China Tourism Year (ECTY2018). On this occasion, visitors will be able to discover some life-size historic Chinese lanterns in the park. They will be exhibited until the end of August.